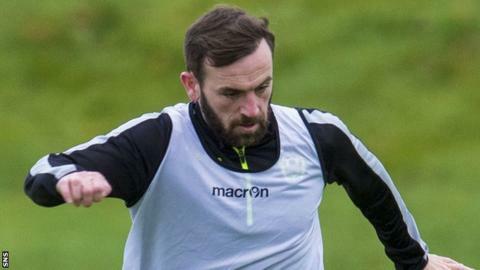 Former Scotland forward James McFadden hopes to make a short-term impact with Motherwell before completing a move to Philadelphia Union in January. The 32-year-old began a third spell at Fir Park on Friday after training there since the summer. "I've been getting fitter every day and it just made sense," he said. "It is a good fit for me and for the club. "It is short term, hopefully everything works out and I will be off to Philadelphia in the new year." McFadden has been without a club since being released by Well's Scottish Premiership rivals, St Johnstone, at the end of last season. The former Everton, Birmingham City and Sunderland striker has travelled to see the set-up in Philadelphia, where former Dunfermline Athletic and St Mirren defender Tommy Wilson is director of the youth academy and former Scotland full-back Iain Munro is a coach. "I went over, I had a trial, they were very happy with how it went and at the time they couldn't sign me even if they wanted to," said McFadden of the club that finished second bottom of Major League Soccer's Eastern Conference this year. "It is a case of just waiting. They've got a few things going on in terms of getting rid of some players and then hopefully we'll get round the table to agree a deal for January. "I held off signing anywhere until I knew what was happening as that's what I wanted to do." McFadden made half of his 20 St Johnstone appearances from the bench last season but is hopeful of breaking into Mark McGhee's Motherwell side. "The manager's been impressed with what he saw, so it just made sense," the striker said of his short-term contract. "I just want to help the team push up the league and help the younger players - that was another part of the conversation I had - to try to help the younger players the manager is trying to introduce to the first team. "The motivation for me is purely for the love of the game. I love playing, I love turning up for training, but anybody who knows me knows I am never happy sitting on the bench." McFadden came through the youth ranks at Fir Park to win a move to Everton and he returned in 2013 during a successful spell under Stuart McCall. "The year and a half I was there, we had two second-place finishes and realistically it was never going to be any better than that," he added. "If it turns out to be the last team I play for Scotland, and I don't know if it will be, it will be ideal for me to finish where I started and then go and do something new. ".